Vita Nova is the University of Delaware’s student-operated fine-dining restaurant, offering an award-winning lunch buffet Monday through Friday and elegant four-course dining Wednesday through Friday during the fall and spring semesters. It is a University of Delaware tradition and an extraordinary dining experience. The more casual Bistro offers a three-course theatre menu, a small plate menu, custom cocktails and an extensive wine selection. Both dining rooms are located on the second floor of the Trabant University Center, 17 W. Main St. in Newark, Delaware. We are now accepting reservations. Please call 302-831-0500, email vitanova@udel.edu or use the reservation form. First lunch will be held on Monday, Feb. 18. First dinner will be on Wednesday, Feb. 20. Last day open is Friday, May 17. The Trabant Parking Garage is adjacent to the Trabant Center and requires that you pay upon arrival and enter your license plate number. The PassportParking mobile app can also be used at the garage. For more information please visit the Parking Services website. The Vita Nova tasting menu includes an appetizer trio, artisan breads, salad, intermezzo, entrée and dessert. Artichoke Soup: Parmigiano Reggiano, Chervil Oil. Ahi Crudo: Toasted Pine Nuts, Basil, Crispy Shallots. Pickled Carrots: Baby Arugula, Goat Cheese. Baby Spinach salad with Roasted Beets, Crispy Pancetta and Feta Cheese in a honey lemon dressing. Farro Rice Pilaf, Maple Gastrique, Baby Carrots. Black Rice, Citrus Beurre Blanc, Snap Peas. Morels, English Peas, Asparagus, Jumbo Shrimp, Champagne Cream Sauce. Fava Beans, Corn Coulis Cream Sauce, Fennel Pickle Relish. Cabernet Demi-Glace, Borsin Duchesse Potatoes, Asparagus. Vita Nova students offer a featured homemade dessert sampler as part of the tasting menu, or other desserts upon request. Toasted Coconut Layer Cake: Chantilly cream, graham cracker crumb. Chocolate Raspberry Pot au Cream: Dark chocolate, fresh raspberries. Tableside nitrogen – churned UD Vanilla Bean Ice Cream over Homemade Baily’s Irish Cream. Five artisan cheeses, nuts, quince paste, melba toast. Stilton (England): The king of English cheese, one of the world’s oldest blue-veined cow’s milk cheeses. Made in the artisan tradition by rural farmers in the shires around the town of Stilton. Pierre Robert (France): From the Champagne region of France, this triple cream brie-style cheese is rich and buttery with a tangy finish. Cypress Grove “Purple Haze” Chevre (California): From California’s northern Humboldt County, a perfect mixture of lavender and fennel pollen gives this goat cheese its addicting flavor. Cahill’s Porter Cheddar (Ireland): An Irish farmhouse cheddar aged with Irish porter beer. Cave-Aged Gruyere (Switzerland): This alpine classic is a firm cow’s milk cheese with a nutty flavor and hints of toffee and toast. Seasonal Fruits or Crème Brûlée available upon request. The menu for our lunch buffet changes weekly. Please visit our Facebook page for the current menu. Vita Nova gift cards and 20th Anniversary Cookbook are now available for purchase online. Sign up for our email list to be the first to find out about our special events. Visit us on Facebook and Pinterest to learn more about our students and operations. The hospitality industry values students who have applied their knowledge in hands-on environments. 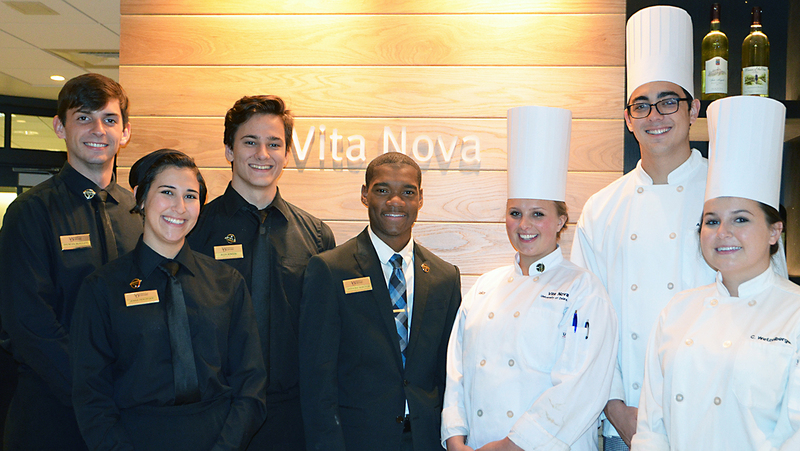 Vita Nova serves as a learning laboratory for students in the Lerner College’s Department of Hospitality Business Management. Each student gets a diverse educational experience by rotating through 17 different positions both in the dining room and in the kitchen. Students gain invaluable culinary, service and management experience in this learning lab. 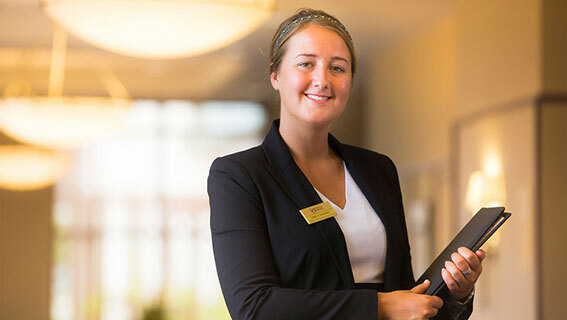 In Latin, “vita nova” means “new life” or a new beginning, a particularly appropriate name since Vita Nova is the last applied classroom experience for each HRIM student before beginning a new life in the hospitality business. Each semester, students are selected for a unique internship experience, in which they are Student Managers at Vita Nova. Aramark Scholars are made possible by a generous gift from Aramark Educational Services, LLC. Your support to the University of Delaware makes a difference for every student. Establish and further your career in the global hospitality industry.